Download "Section IV. 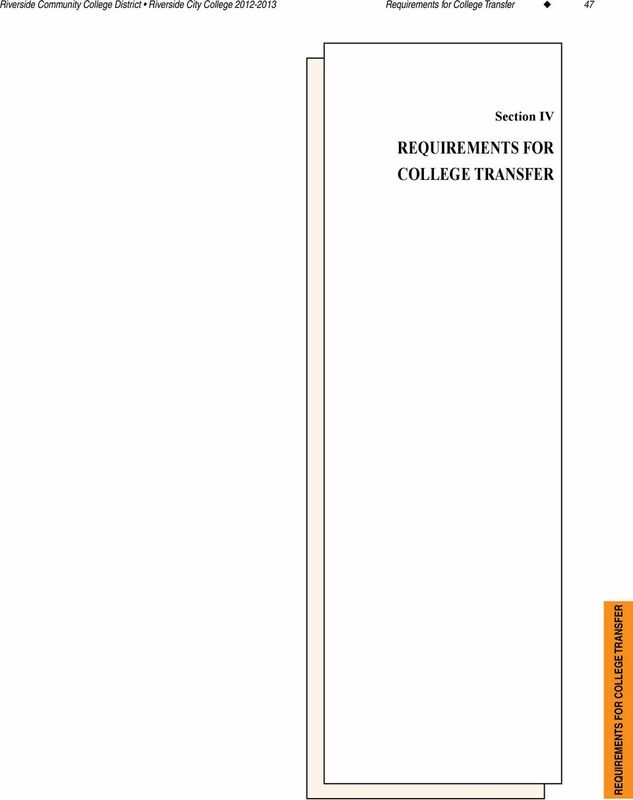 Requirements for College Transfer"
6 52 Requirements for College Transfer Riverside Community College District Riverside City College Required Courses: (18 units) SOC-1 Introduction to Sociology 3 Electives from Group A 6 Electives from Group B 6 Electives from Group C 3 Electives Group A (6 units) SOC-2 American Social Problems 3 MAT-12 Statistics 3 or MAT-12H Honors Statistics 3 SOC-50 Introduction to Social Research Methods 3 Electives Group B (6 units) SOC-10 Race and Ethnic Relations 3 SOC-12 Marriage Family Relations 3 SOC-20 Introduction to Criminology 3 Electives Group C (3 units) SOC-3 Social Inequality 3 SOC-15 Women in American Society 3 ANT-2 Cultural Anthropology 3 PSY-1 General Psychology 3 PSY-8 Introduction to Social Psychology 3 Associate in Arts for Transfer Degree The Associate in Arts in Sociology for Transfer degree will be awarded upon completion of 60 California State University (CSU) transferable units including the above major requirements and the Intersegmental General Education Transfer Curriculum (IGETC) or California State University General Education (CSUGE) requirements and 3-8 units of electives with a minimum grade point average of 2.0. All courses in the major must be completed with a grade of C or better. 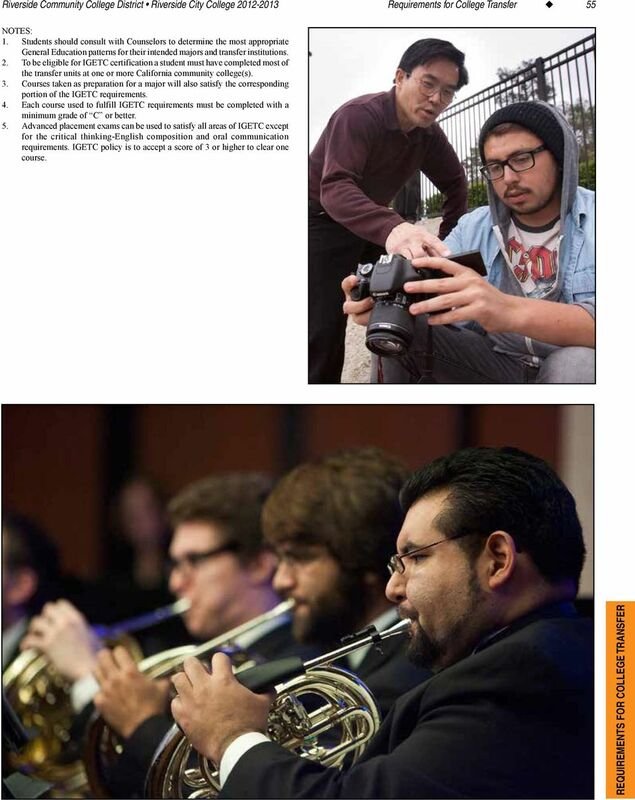 (Students completing this degree are not required to fulfill the RCCD graduation requirements found in section VII. Additional degree requirements: Health Education and Self Development.) 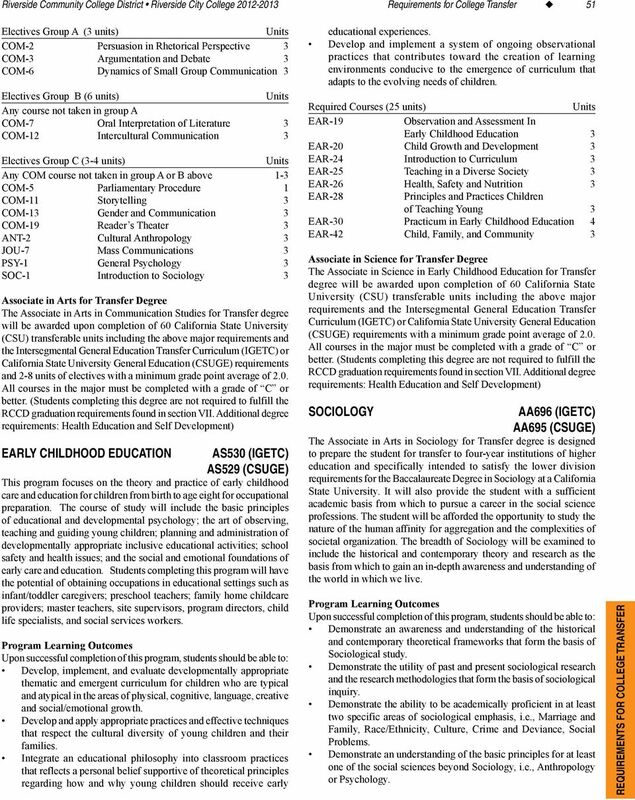 Required Courses (18 units) THE-3 Introduction to the Theatre 3 THE-32 Theatre Games and Exercises 3 THE-5 Theatre Practicum 3 or THE-6 Advanced Theatre Practicum 3 Electives Select from the list below 9 Select 9 units from the following: THE-25 Makeup for the Stage 3 THE-33 Creating a Role 3 THE-41 Elementary Stagecraft 3 THE-44 Theatrical Set Design 3 THE-46 Theatrical Costume Design 3 THE-48 Theatrical Lighting Design 3 Associate in Arts for Transfer Degree The Associate in Arts in Theatre Arts for Transfer degree (AA-T) will be awarded upon completion of coursework totaling 60 California State University (CSU) transferable units including the above 18 units of major requirements and the Inter-segmental General Education Transfer Curriculum (IGETC) or California State University General Education (CSUGE) requirements and 3-8 units of electives with a minimum grade point average of 2.0. 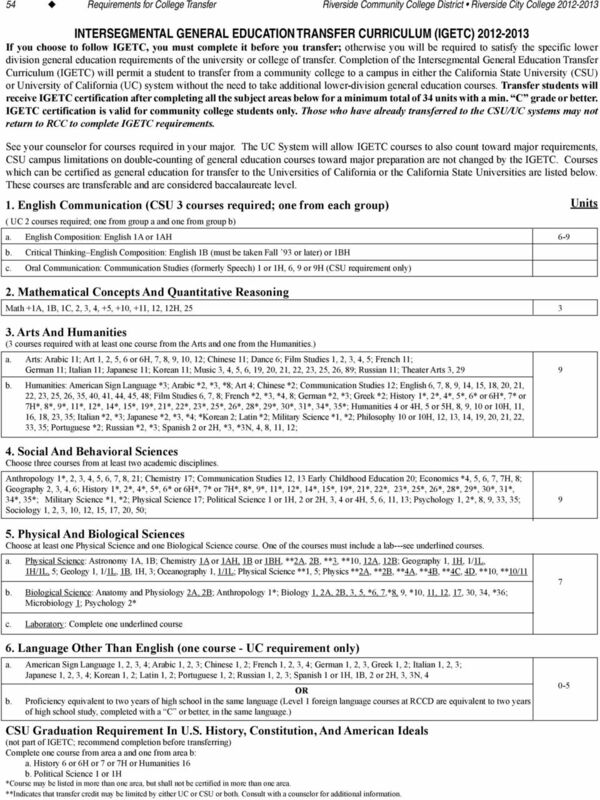 All courses in the major must be completed with a grade of C or better. 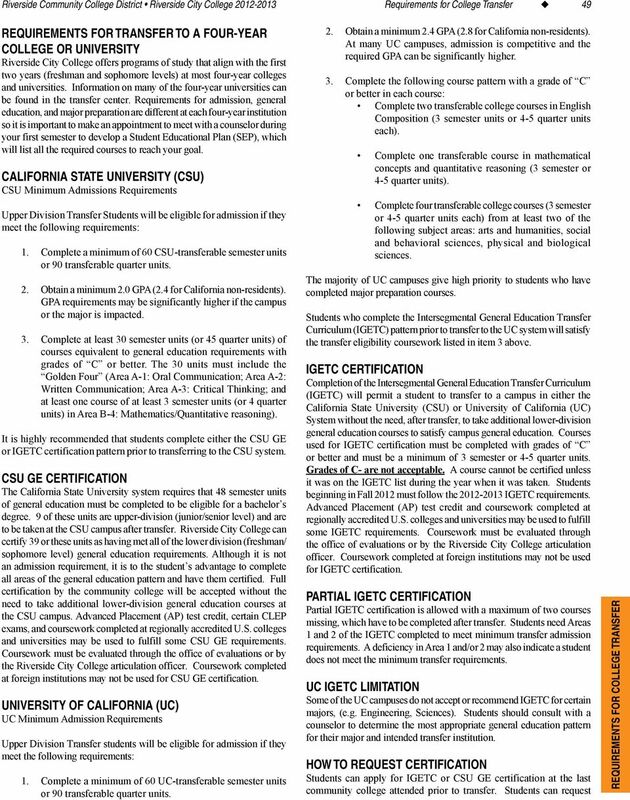 (Students completing this degree are not required to fulfill the RCCD graduation requirements found in section VII. Additional degree requirements: Health Education and Self Development.) Theatre Arts AA747 (CSUGE) AA748 (IGETC) An Associate of Arts in Theatre Arts degree for Transfer (AA-T) from Riverside City College represents the attainment of the needed proficiency that prepares students to audition or demonstrate design skills for acceptance into private, state college and university departments for careers in the field of Theater. 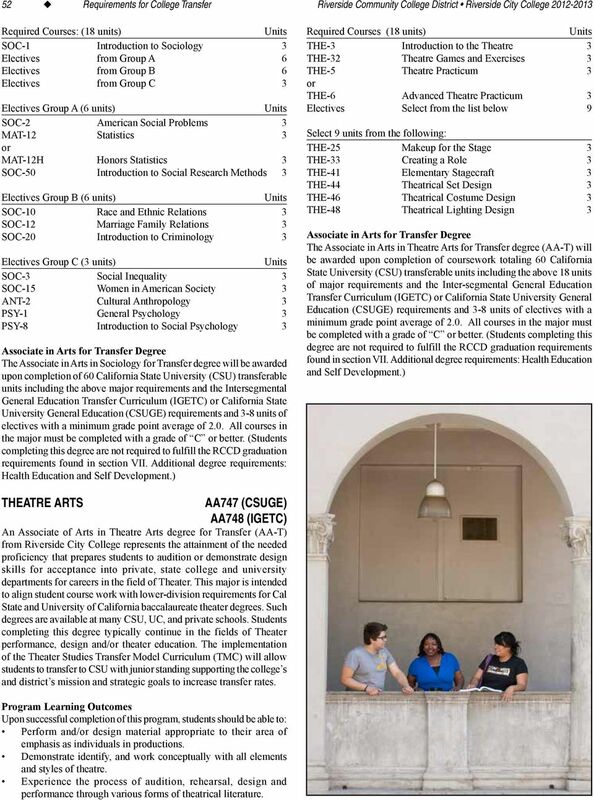 This major is intended to align student course work with lower-division requirements for Cal State and University of California baccalaureate theater degrees. 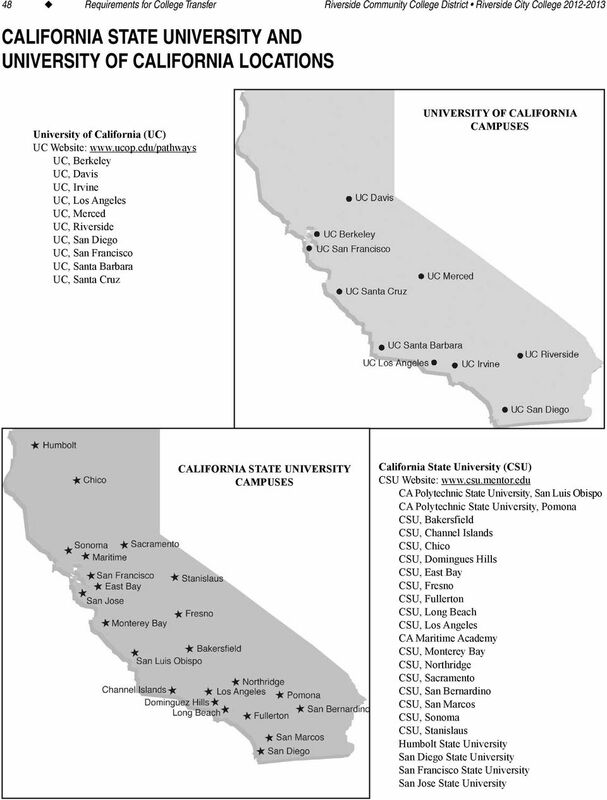 Such degrees are available at many CSU, UC, and private schools. Students completing this degree typically continue in the fields of Theater performance, design and/or theater education. 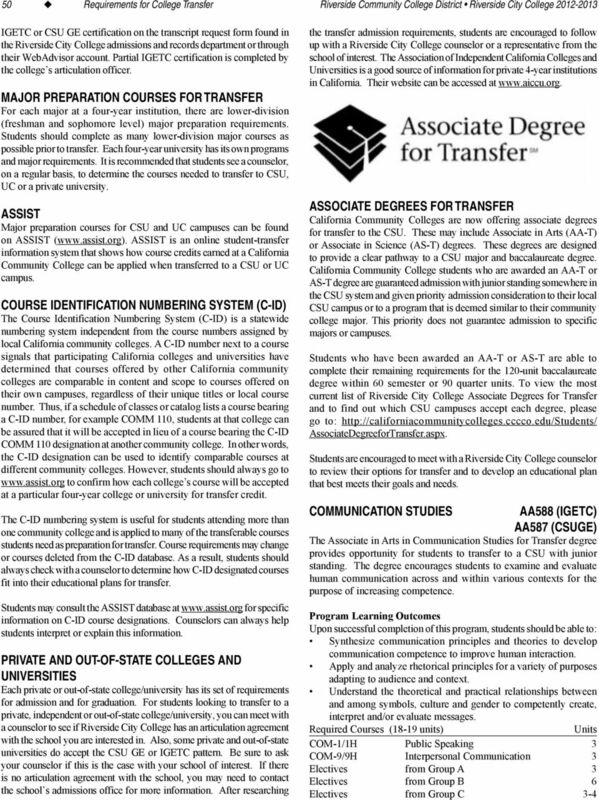 The implementation of the Theater Studies Transfer Model Curriculum (TMC) will allow students to transfer to CSU with junior standing supporting the college s and district s mission and strategic goals to increase transfer rates. Program Learning Outcomes Upon successful completion of this program, students should be able to: Perform and/or design material appropriate to their area of emphasis as individuals in productions. 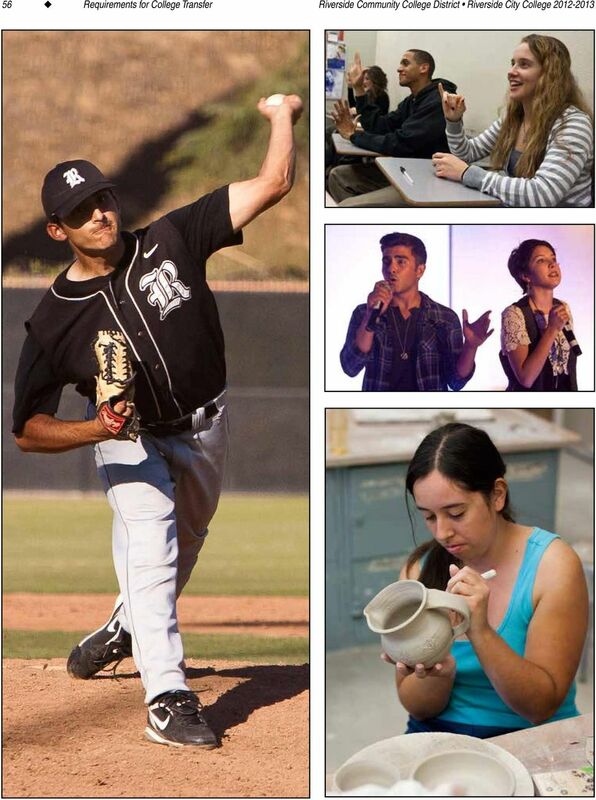 Demonstrate identify, and work conceptually with all elements and styles of theatre. Experience the process of audition, rehearsal, design and performance through various forms of theatrical literature. level courses. Credit is given toward computing the grade point average but may not be used toward graduation requirements. D3. Minimum of 3 additional semester units from D1 or D2 above. 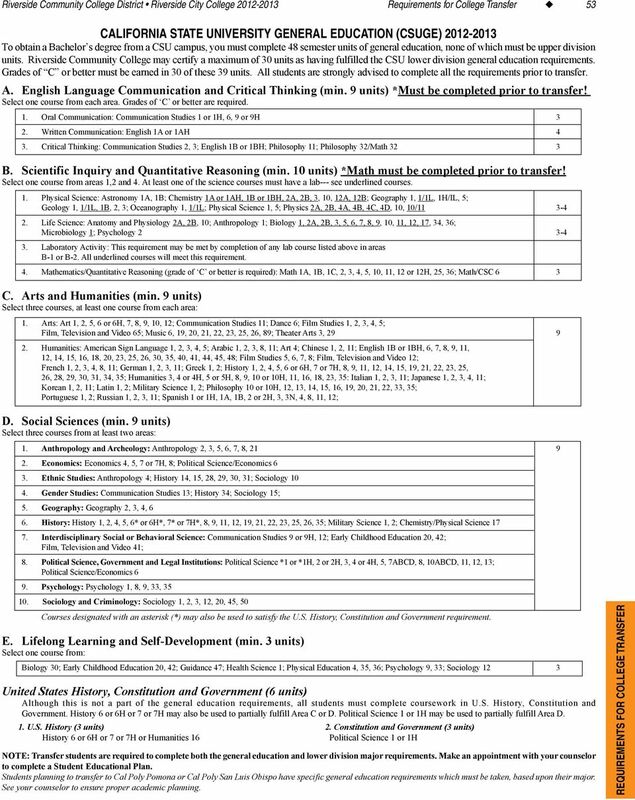 CSU SIMILAR DEGREE REPORT by Discipline March 19, 2012. Approv. Accredited A college or program that has been certified as fulfilling certain standards by a national and/or regional professional association. PAGE 1 OF 6 Academic Renewal A process by which a student petitions to have college grades of a D or F excluded from GPA calculation; however, the courses and grades will still appear on a student s transcript. Associate Degree Programs ASSOCIATE IN ARTS DEGREE (A complete list of General Education Core Curriculum transfer courses is available at the Illinois Articulation Initiative website: www.itransfer.org).